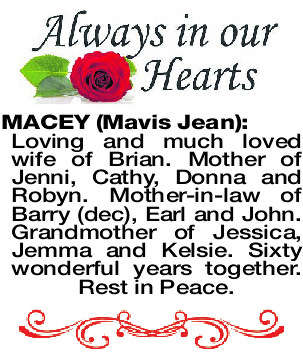 MACEY MAVIS JEAN Loving and much loved wife of Brian. 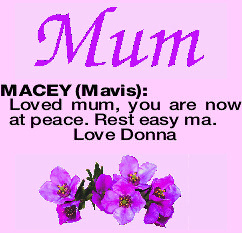 Mother of Jenni, Cathy, Donna and Robyn. Mother-in-law of Barry (dec), Earl and John. 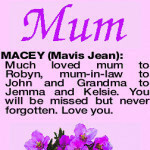 Grandmother of Jessica, Jemma and Kelsie. Sixty wonderful years together. Rest in Peace. 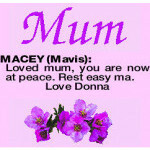 MACEY MAVIS Loved mum, you are now at peace. 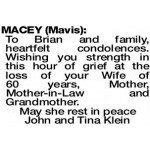 Rest easy ma. 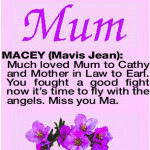 MACEY MAVIS JEAN Much loved Mum to Cathy and Mother in Law to Earl. You fought a good fight now it's time to fly with the angels. 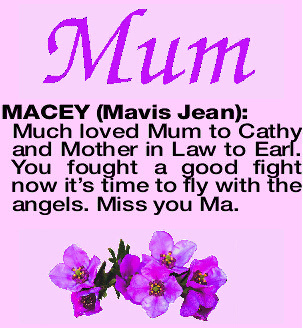 Miss you Ma. 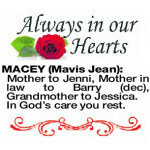 MACEY MAVIS JEAN Mother to Jenni, Mother in law to Barry (dec), Grandmother to Jessica. In God's care you rest. 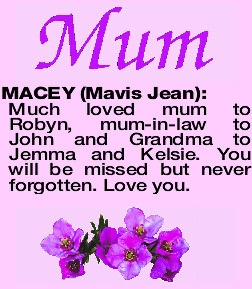 MACEY MAVIS JEAN Much loved mum to Robyn, mum-in-law to John and Grandma to Jemma and Kelsie. You will be missed but never forgotten. Love you. 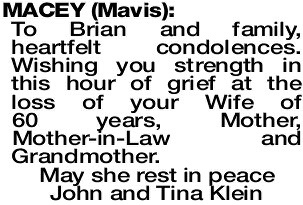 To Brian and family, heartfelt condolences. 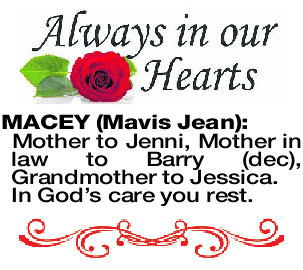 Wishing you strength in this hour of grief at the loss of your Wife of 60 years, Mother, Mother-in-Law and Grandmother.